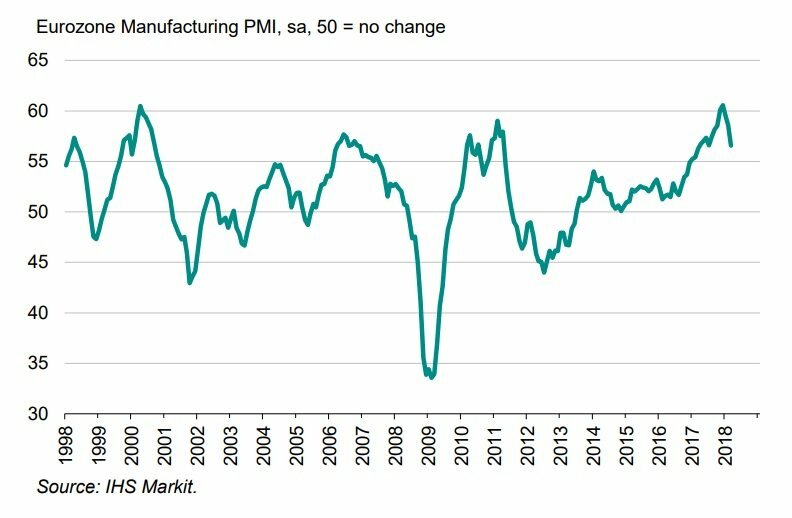 The manufacturing activity in the Eurozone decelerated sharply in March with the headline manufacturing purchasing managers index (PMI) cooling off to 56.6 in March, down from 58.6 in February. The growth rate in manufacturing though remains strong by historical standards and the appearance of inflationary pressures will confirm that the ECB policymakers are on the right path towards sustained inflation of close to 2% and can end the era of extraordinary monetary stimulus. The slowdown in the manufacturing activity to the lowest level in last 8-months is a result of three important factors. First, it is the base effect of slowdown after the PMI reached multi-year high at the turn of this year and the short-term capacity constraints limit the economy’s ability to grow so quickly for a prolonged period of time. The second important factor is the fear factor of export-oriented economies of the Eurozone, especially German economy, with the US-led trade wars taking a toll in business confidence. This has been particularly pronounced in German ZEW index of investors’ confidence in March that has decelerated sharply and according to IHS/Markit’s PMI survey, the new export orders fell slipped to a 15-month low. Appreciation of Euro is feeding through to higher export prices making the life of the Eurozone exporters harder in foreign territories. Even with the headline manufacturing PMI cooling down in March, the Eurozone growth prospects remain firmly anchored on the upside. With PMI reading well above 50-mark, the economic growth remains robust by historical standards, with all the major Eurozone countries rising strongly, indicating broad-based expansion. And this includes Greece. Manufacturing activity is therefore seen positively contributing to GDP growth in the first quarter, and the appearance of inflationary pressures will be welcomed by policymakers at the European Central Bank.